The best apple cider vinegar brands have touted their supplement as a source of overall wellness. In fact, there are some solid evidence-based benefits that suggests apple cider vinegar, when taken as a drink, a tablet, or a capsule, can lower blood pressure, improve blood glucose levels, and break down fat while helping to prevent weight gain. What’s more, apple cider vinegar can help to boost your digestive health, improve circulation, and even soothe a wide variety of health issues. While downing a couple of shots of apple cider vinegar every day isn’t an instant remedy, and may not be your consumption preference, there are a ton of benefits to be had from taking the elixir in pill, tablet, or capsule form, and there are companies that produce delicious, convenient RTD drinks with the ingredient. With so many options for consumption, an ultimate guide that covers the spectrum of apple cider seemed essential. We’ve researched and discovered dozens of top-rated apple cider vinegar options on the market. And as a bonus, we’ll look at some tasty DIY recipes, too! Popping pills and capsules isn’t for everyone, that’s for sure. Fortunately, apple cider vinegar comes in a variety of drinks that are made for a range of benefits, like weight loss, health, and glowing skin, and can be used in cooking, as a hair product, or even in a cup of tea with lemon and honey. Below are our top 5 drinks and the one we think you can bypass the next time you’re on the hunt for a health-infused beverage. If you want glowing, healthy skin, Bragg Apple Cider Vinegar (ACV) is the way to go. Besides being one of the most trusted brands on the market, the company has exceptional control over the quality of their ingredients since they tend to use organic apples sourced from the U.S. only. Not only does it help the skin glow, though, this brand has shown to relieve heartburn and stomach upsets, prevent acne, and there are several flavors to try, including Ginger Spice and delicious Apple Cinnamon. Vitacost is a well-known brand for general health products, and their ACV drink is no exception. This brand’s ACV comes in the form of a fermented juice made of 100% organic and fresh-pressed apples. The juice is unpasteurized and contains the “mother” (important for optimal ACV health benefits and discussed later on in this guide). The brand does not include added sugar or artificial colors and flavors, and it is suitable for both vegetarians and kosher individuals. This is a top-quality, yet budget brand that is great for weight loss and over all gut health. Yet another exceptional unpasteurized and raw option, this brand’s ACV drink is made from naturally fermented apple juice that has been gently aged with vinegar. Some find this drink to be less watery and much richer-tasting than other brands, making it a very pleasant every-day drink. It’s also a great drink for a variety of health issues, like dry skin, circulation, and improved blood pressure. This is another ACV drink that contains the “mother” and offers a myriad of health benefits when you use just one tablespoon of the drink in a glass of water or detox tea with lemon and honey. Some find it’s a great way to start the day as it is not only cleansing and refreshing, but it boosts the metabolism, too, and helps to alleviate any morning sickness and upset stomach issues. This is probably a staple in your kitchen if you are already sold on the benefits of using ACV. It’s a versatile drink with a ton of culinary ingredients, and can be used as a dietary supplement, a dressing, and even a cleaning aid. However, it is filtered, which means it does not contain the all-health-encompassing “mother” and you will be missing out on iron, vitamins, and probiotics found in the above 5 brands. What could be easier – and tastier – than getting your daily does of apple cider vinegar in a ready to drink (RTD) bottle? 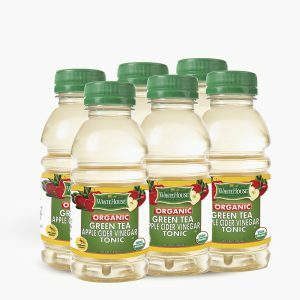 ACV has come a long way since the days when grandma used to swig a spoonful every morning and now, more and more manufacturers are creating flavored beverages with all the benefits of ACV and loads of taste, too. Here are our best picks for 2019. Bragg is definitely the brand for taste and weight loss, so why not buy in bulk and get the whole family on board! Whether it’s just the raw ACV you want or the flavored, and highly refreshing, RTD, you cannot go wrong with this brand. If your number one goal is weight loss – you can get it in this nifty 16oz bottle, and in a range of yummy flavors. I especially find the vinegar and honey flavor tangy, clean, and a party for the taste buds. It’s amazing for relaxing upset stomachs, too, leaving me less bloated while increasing my metabolism. This is a delicious vinegar in terms of drinks. The brand naturally ferments their ACV from certified organic apples to create a wholesome and tangy flavor. The ACV is unpasteurized, raw, and unfiltered, which helps to preserve the “mother” cultures. The ACV is also free from preservatives and can be enjoyed in food and as a tonic. This brand’s raw apple cider vinegar also contains the “mother” and is made from freshly pressed organic apples grown in the U.S.A. The mixture is unfiltered, raw, and unpasteurized, and the delicious taste will take your veggies and salads to a whole new level. This product comes in 12oz, RTD cans and has a whopping 1.5 tablespoons or organic apple cider vinegar among the ingredients. It’s a fantastic daily drink that doesn’t need to be diluted, and offers a crisp, fruity taste, fresh bubbles, and a mere 50 calories a can. Available flavors include Passion Fruit Mango, Strawberry Rose, and Lemon Honey Ginger. This RTD is amazing if you’re tired of making your own raw ACV drink on a daily basis and just want to grab a bottle of tasty, healthy, ACV. With this brand, you can balance your diet without the bitter taste of raw ACV. All the mixing has been done for you and you get to enjoy the benefits of ACV and green tea in one grab-and-go bottle. Containing the “mother” and made with certified organic apples, this undiluted and raw ACV RTD is so tasty, and so beneficial. Adding this drink to your daily diet will help with digestion, detoxing, glowing skin, and can even be used to revive your hair and bring it back from damage. It’s a must-have for the pantry and is a fantastic substitute for white and balsamic vinegar. Another delicious RTD containing the “mother,” the taste is a little stronger than our other recommended drinks, but you can dilute it with a little bit of filtered water. It works really well for reflux and indigestion, and I know of people who have lost a substantial amount of weight when they include this drink in the apple cider vinegar diet. It’s pretty tough to pick a drink to avoid in this category as most of them are delicious! The Bragg Limeade, though, isn’t the best flavor out there. In fact, we found the flavor of lime to be seriously lacking, and for the price, we’d rather find a zingy and more refreshing option. When you’re in a hurry or you just don’t love the taste of ACV in drink form, capsules are a great option. You will still get all the health benefits, you can keep the bottle of capsules on you, and you can take them with you if you go travelling. Here’s our top picks for 2019. These capsules are available in bottles of 240, 500mg capsules. This brand’s soft and easy to digest capsules are free from gluten and made with organic ACV right here in the U.S. This brand’s products are great as an overall dietary supplement. Nutricost promises a pure ACV powder in each capsule and they do help with cravings if you are aiming to lose weight. It’s a good idea to take them for 30 days in a row before seeing results. The capsules have a vinegar odor to them but you won’t taste it and the soft capsules are easy to swallow with water. This brand recommends taking 2 capsules a day for 90 days to see improved results with weight loss, circulation, skin, and even gout and gut issues. These pills are potent and contain 450g of ACV powder which is produced in a high-quality GMP facility. Their products are fantastic for providing the body with nutritional support and they are free from a range of allergens like yeast, milk, soy, and gluten. There’s no after-taste with these soft capsules, and they are available in bottles of 180 capsules which contain a mega 450mg each of raw ACV powder. It’s also great for neutralizing acid in the body, which is why it can help with arthritis and other joint problems. This brand offers an amazing all-rounder of a product, since the capsules contain not only ACV, but also kelp and spirulina. That means you can look forward to benefits such as an improvement in water retention and inflammation, improved circulation, a natural detox, and an improvement in the condition of your hair, skin, and nails. The capsules come in bottles of 90. This product, available in bottles of 120 capsules, has been reported to improve your digestive system, help with weight management, and overall skin and hair health. The capsules contain a compound of amino acids, minerals, and vitamins, too, and they’re pretty good value for money. This one offers amazing value for money with a whopping 200 capsules per bottle. Capsule form of the delicious drink, Piping Rock’s ACV products are great for helping with gut and gout problems, improving circulation, and a range of overall health benefits. No artificial flavors, colors, or preservatives, this is all the benefits without the taste of vinegar! A great name in the health products business, Vitacost’s ACV products are made with fermented, 100% organic apples, and do not contain any artificial colors, flavors, or added sugar. The tablets are suitable for both kosher and vegan users. This one also offers good value for money. This brand’s capsules are great for circulation and for supporting the digestive system. Their products contain heaps of vitamins and minerals, too, for overall health benefits. One capsule contains 500mg of apple cider vinegar as well as 100mg of honey powder for added potency and purity. These capsules just seem massive compared to regular ACV capsules. We also feel that the formula has changed somewhat and there is a rather nasty odor. We’d ditch these for a RTD or one of the above capsules any day. Drinks aside, capsules and pills also offer a myriad of benefits in easy-to-swallow, transportable form. If you’re not the biggest fan of soft gel capsules and aren’t keen to keep buying drinks, then we’d say opt for apple cider vinegar tablets that you can take anytime, anywhere, and still reap all the amazing benefits that raw, unfiltered apple cider vinegar, complete with the “mother” has to offer. So, which are the best brands for your needs? Here’s out top 5 best apple cider vinegar tablets for 2019. With 200 tablets per bottle, we’d call this good value for money and a great investment in your health. The tablets are suitable for vegans and deliver all the nutritional benefits of pure ACV in pill form. There is no corn, sugar, gluten, lactose, wheat, milk, and the like in the tablets, making them pure and suitable for pretty much anyone. The tablets are small and easy to swallow. This bottle comes with 180 tablets and is great for sorting out acid reflux when taken as part of a daily diet. They are small and palatable and won’t upset your stomach, but they do smell a little – however, they smell a lot less than actual vinegar! Available in bottles of 200 potent, yet easy to swallow tablets, this brand offers a great product for aiding digestion and reflux while balancing the body’s pH system. You only have to take one tablet a day with this brand so it’s easy on the pocket, too. These tablets have proven good for helping to reduce blood pressure, also. A little pricey for 60 tablets, but a great source of vitamins and minerals along with apple cider vinegar. This tablet is suitable for vegetarians and shown to support weight loss when used in conjunction with a healthy diet. These tablets taste great, and, best of all, they are chewable and delicious. Another brand that is easy on the pocket with 100 tablets per bottle, this tablet works to support fat burning and promote a healthy metabolism. The tablet is rich in minerals and enzyme, and makes for a powerful cleanser. This one also works well to control the appetite and gives you a great boost of energy if you’re heading off to gym. If you’re allergic to nuts, avoid this one! It contains tree-nuts and has also shown to offer little results compared to our top 5 products. Whether you prefer to pop a couple of teaspoons of apple cider vinegar into your morning glass of water or you use it in marinades for a tangy and healthy flavor, this ingredient is seriously versatile. But, like anything else, you get amazing brands and pretty average brands. Below we review our top ACV makers so you don’t have to do the legwork! Bragg manufacturers organic, raw, and unfiltered apple cider vinegar containing the “mother” which means it contains live cultures and is unpasteurized. Bragg already has an established name in the heath food industry and is well worth every Dollar. This is another exceptional brand that produces raw and unpasteurized ACV made from naturally fermented apples that have been gently aged with vinegar. White House takes great pride in their production of apple cider vinegar products. Their ACV is made by converting the freshest apples into acetic acid. The mixture is then reduced to 5% acidity to make for uniform, and delicious, pickling. Viva Naturals has a good rap as far as health products go. Their apple cider vinegar contains the “mother” enzymes and cultures, which means health benefits include more regular digestion, increased energy, and a faster metabolism. Whether you want to start supplementing your diet with apple cider vinegar for weight loss, appetite control, or the many health benefits this wonder vinegar can offer, there are a few things you still need to consider before buying a product. Other than whether you want to use the vinegar in your cooking or take it as a tasty drink, soft capsule or little, tasteless tablets along with thinking about what sort of quantities to buy, here are some things we suggest you think about before clicking that “buy now” button. We’ve mentioned the “mother” throughout this guide, so it’s time to explain. When shopping for ACV, the first thing to consider is the ingredients of a product, and the “mother” really needs to be one of them if you want optimal results. If you’re buying ACV in liquid form, take a look at the very bottom of the bottle. If there is some brown stuff floating around, that is the “mother.” It may look a little gross, but it’s the best part as it comes from the fermentation process which means it contains heaps of bacteria and enzymes which is exactly the things that make apple cider vinegar so powerful. Getting the dosage right with apple cider vinegar is crucial. It does differ from person to the next, so take things like health conditions and age into consideration. Consumed in excess, apple cider vinegar can cause harm to the body. Look carefully at the dosage instructions, and remember that if you’re going to drink the vinegar, it is highly recommended that you dilute it to avoid drastic damage to your gut, health, and skin. ACV is incredibly acidic and this means there could be an adverse reaction with certain drugs. If you do suffer from a health disorder, always make sure that you consult your doctor before embarking on an ACV trial. However, when consumed in the right amount, ACV can promote weight loss over a certain period of time. Some of the known side effects that can occur with excess consumption include reduced levels of potassium in the body, tissue disruption, and damage to tooth enamel. Some people have also complained of irritation and discomfort after drinking the vinegar. Be sure to read about the side effects before buying a bottle of ACV liquid or pills. has undergone pasteurization and is manufactured mainly for flavor and visual appeal as it is not cloudy in appearance. It doesn’t contain the health-enhancing properties of organic ACV as it does not contain the “mother” enzyme. though, is natural apple cider vinegar in its purest form. It’s rich in color, cloudy, and contains the “mother” which means it offers all the health benefits, vitamins, and minerals you expect to get when you consume ACV. With such flexibility, there are tons of ways to incorporate ACV in your cooking. Here are our top 5 recipes! Just seven easy-to-find ingredients and a few minutes of preparation is all these delicious chicken thighs take and they include ACV! What could be more delicious than a virgin cranberry cocktail complete with the health benefits of ACV? Take your salads from blah to zing! With this healthy and tasty salad dressing recipe. You don’t need to be vegetarian to enjoy a great salad, especially this delicious butternut and kale combination. Seriously, what could be better than indulgent, yet mega-healthy pizza complete with ACV and flatbread base? By the way, if you want to know more about the health benefits of using apple cider vinegar in your diet, check out this video that explains it well. There you have it! We’ve been hard at work to bring you the best products, varieties, and manufacturers of apple cider vinegar to help improve your overall health and well-being. Whether you want to start including the vinegar in raw form in your cooking, buy bulk RTDs or swallow tasteless, yet powerful pills or capsules, there is an apple cider vinegar product on the market to suit your taste buds, lifestyle, and budget. Don’t forget to read the ingredients and side effects to make sure you pick up something that’s going to work best for you and you can look forward to so many health benefits! WARNING: it is true that drink manufacturers create beverages that simply follow “trends.” Please keep an eye on the labels and ingredients listed in any apple cider vinegar drink and continue educating yourself about its health benefits and healing properties of the wonder drink.